Powerful free component to show, edit, print, export and import Excel spreadsheet in .NET application. Learn how to Set up. 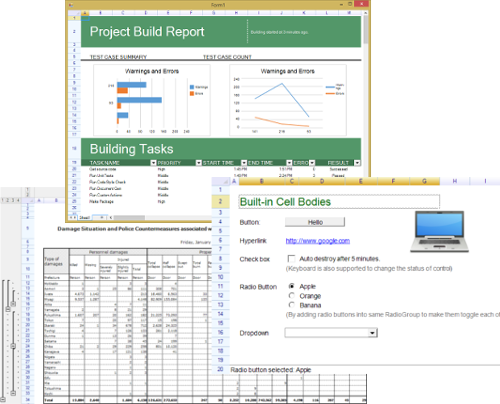 Loading and saving Excel format, including style, format, drawings and charts. Microsoft®, Windows®, Windows NT®, Windows Server® and Windows Vista(TM) are either registered trademarks or trademarks of Microsoft Corporation in the United States and/or other countries. Word and Excel are either registered trademarks or trademarks of Microsoft Corporation in the United States and/or other countries. Apple®, Macintosh®, Mac OS®, iOS, iPad, iPhone and iPod touch are either registered trademarks or trademarks of Apple Computer, Inc. in the United States and/or other countries. Some icons used in this website are designed and provided by icons8.com.